​The annual harvest generates a real buzz as the tempo ramps up with wineries working 24/7 to pick and process the grapes. All done to the steady beat of their fave playlists. We only asked three wineries for their 2019 vintage playlists – which you can download from Spotify here – but it seems there's a common rhythm to a Hunter Valley harvest with Daryl Braithwaite, Prince and Beastie Boys blasting in many sheds. Harvesting grapes begins in January with whites ripening first, followed by reds. When the viticulturist or winemaker decides the time is right to pick, it's all hands on deck with some grapes harvested by hand, particularly vines on steep hills, while others are harvested mechanically. Many wineries choose to pick at night when it's cooler and the freshly picked grapes are then sorted in the winery, before crushing, de-stemming and pressing. It's a continuous process until all the grapes are harvested and processed, which can be weeks or months depending on the size of the vineyards. Visiting a wine region during vintage has to be the ultimate wine experience, but what do – the winemakers themselves think? Ever any debates over the choice of music to get through vintage? Triple J is always on the radio and never a debate. Unless the cricket is on, then we listen to the cricket! Best thing about the mad scramble that is vintage? The rush with the cut and thrust of it all. There is a palpable excitement when the fruit is coming in and the whole circus gets started. We have one of the longest vintages in Australia at Pepper Tree – which goes from January through to May, so it gets a bit tiring by the end of it. So many! Bacon and egg rolls. Fancy Dress Fridays. Vintage shirts. When it's all done and dusted, how do you celebrate? We head to Newcastle and have lunch at Nagisa Japanese (Semillon and sashimi) before hitting the pubs for a few frosties. The whole crew stays at the Novotel for the night. ​Ever any debates over the choice of music to get through vintage? The Brokenwood playlist is long and varied and changes each year with our Vintage Cru. As long as the song played is allowed to finish, all changes are acceptable. Where to start? 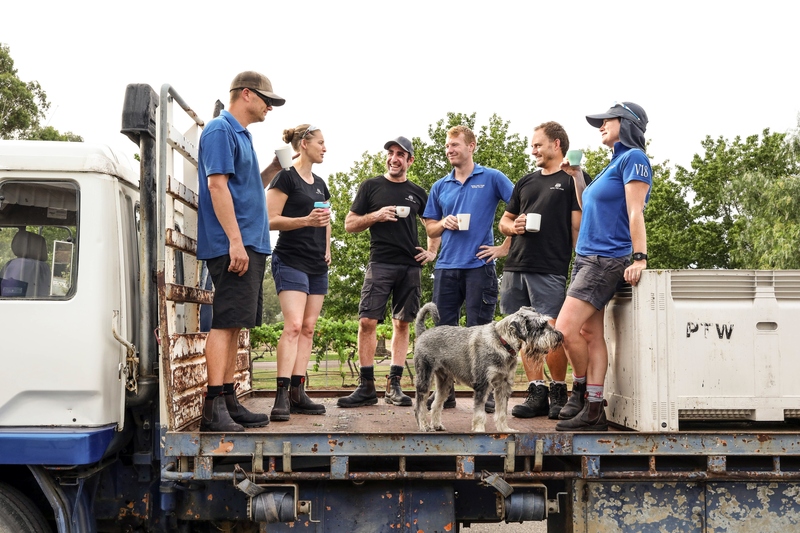 The buzz and excitement that comes with each new harvest, the camaraderie of our Vintage Cru, the Vintage Cru weigh in, Vintage dinners, staff pick, the annual Brokenwood v Margan Wines curry challenge, and, of course, the cold beer at the end of a shift. A glass of Grape Hammer (Brokenwood's house cocktail: a mix of fresh Semillon juice, ice with a healthy lick of vodka) with a couple of fresh Port Stephens oysters to celebrate the first press load of the season. The Brokenwood end of vintage party is legendary. For sure!! We have different generations, so it can be hotly contested as to the choice of radio station. Triple J seems to reign supreme, with the odd feature of R&B Fridays and KOFM. The natural high – good rush of adrenalin and endorphins, meeting new crew from all over the world and learning about winemaking in their country, working as a team and smashing it! Vintage nicknames often include vintage shirts. End of vintage party with nice food, wine and lots of laughs.